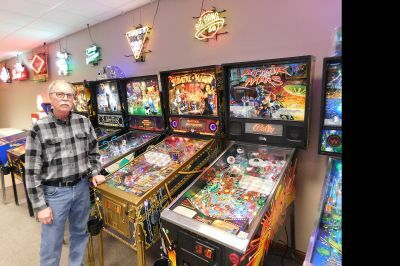 Pinball hobby blooms into a business | News, Sports, Jobs – The Journalhttp://www.nujournal.com/life/lifestyle-feature/2019/01/20/pinball-hobby-blooms-into-a-business/Several pinball machines were themed on popular games. This baseball theme game is designed with a diamond playfield and the flippers represents baseball bats hovering over home plate. The Twilight Zone pinball game one of John Vorwerk’s favorite machines due to the complex rule set for the game. The back art features show creator Rod Serling. Staff photos by Clay Schuldt John Vorwerk stands next to a small sample of his pinball collection at The Pinball Place. Every pinball machine model is unique and some have complex objectives like the Twilight Zone theme game. NEW ULM — For over a decade it looked like it was game over for pinball machines. The classic game of arcades and bars had its heyday in the 1970s and 1980s, but by the 21st century it seemed the last silver ball had finally slipped past the flippers and gone down the drain.